It's one of the biggest anime of 2016, which has in itself created its own backlash. No one had really been expecting much from it. 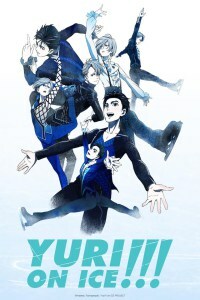 It's a sports anime about figure skaters. By mid-2017, though, it had crushed the competition like eggs under a steamroller to become the fourth best-selling anime of the century (so far), by becoming the latest Big Sensation That Everyone's Talking About. Anyway, it's about ice skating. Everyone here is a skater, a coach or a frenzied fan who sees skating as everything. The plot is a straightforward sports anime plot, with training, rivals, ever-tougher competitions, etc. If you're allergic to sports anime, you might struggle here. (There was a point where entire episodes would be mostly competition performances and I considered fast-forwarding through the skating, although in the end I never went that far.) The show portrays its chosen world vividly and I understand that everyone in the pro skating world has seen this show, for what it's worth. Anyway, Yuri Katsuki is our hero and a Japanese skater who failed dismally last year. He's now overweight and low on confidence. Yuri Plisetsky, on the other hand, is a Russian fifteen-year-old with superstar talent and a hostile, violent, insecure personality. Victor Nikiforov, on the other hand, is the charming purring super-flirtatious Russian champion who's worshipped by the world and seen by all other skaters as the toughest man to beat. Victor announces that he won't compete in the coming season. Instead he'll become Yuri Katsuki's coach, which is news even to the flabbergasted Yuri himself. The skating is taken super-seriously, of course. Yuri's aiming for the world championships, after all. The show gives him a colourful cast of rivals, such as Jean-Jacques "J.J." Leroy (who performs to a song called "Theme of King J.J." and likes posing for the camera while saying "it's J.J. style!! "), Kenjiro Minami (who adorably hero-worships Yuri Katsuki) and Christophe Giacometti (who may or may not be in danger of orgasming during his performance). However they're all giving everything to their skating and feel convincing as top internationals. Their eccentricities don't feel exaggerated or played-up. Incidentally, Japan is really strong at figure skating. It just is. Miu Suzaki and Ryuichi Kihara thus made headlines worldwide by basing their figure skating routine in teh 2018 Winter Olympic Games on the Yuri!!! on Ice theme song, which delights me even though (whisper) I don't like this show's opening and closing themes. As for the romance, you can find point-by-point internet articles explaining why it's so much more respectfully and accurately written than almost all anime. Gay fans say it feels real to them, instead of obviously just being "seme/uke" BL fantasy for a female audience. It's not just a few token suggestive visuals, added to tease. The characters aren't stereotypes. This is one of those shows that's so strong all round that's there's nothing to nitpick. Everything about it is solid, perhaps because, underneath, it's so simple. It's an excellently told series, from the writing down to the loving, subtle animation of all the skaters' routines (hand-drawn, with no CGI). I particularly appreciated the way people's emotional issues could affect their performances on the ice (i.e. externalising inner problems), since after all this is a performance sport. I'll admit that it took me longer than I'd expected to work through all the episodes, though. It's still a sports anime, after all. I normally avoid those. If you go in expecting THE BEST THING EVER!!!!! and you're not really into sports anime, then... well, d'oh. However I always enjoyed the episodes once I'd put them on and I can't deny that it's a classy show, while also being funny and full of entertaining, believable characters.